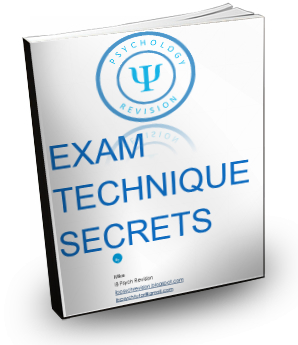 IB Psychology Exam Technique Secrets Now Available! Exam Technique Secrets is finally done and ready to help you get the 7 you deserve on IB Psychology. It has been extensively reviewed and is now published and available for download for under $10. All of the content is original and includes all of the information I pass on to students at revision courses. The book focuses mainly on exam technique and is concise being under 20 pages of quality information. Just go ask your parent or guardian, I have little doubt they will say no to $10 to help relieve some exam anxiety and help you maximize your marks. I would like to hear your feedback ibpsychtutor@gmail.com. Students need to be able to memorize a lot of material nowadays. It is always helpful to have more techniques to get studies and theories to stick in your mind. You may hate when your teacher makes you do presentations but there is new research suggesting presentations may be one of the best ways to remember important material. This study was related to semantic, deep processing of material which is part of the IB psychology syllabus. The researchers wanted to investigate whether participants' memory of material would be affected by knowing they had to teach the information afterwards. Using an independent measures design (between subjects), both groups read the same passage of text. One group was told they were going to teach the material afterwards while the other group was not told anything. The dependent variable was the participants' memory for the material. They found that the group which believed they were going to teach had significantly better recall and more organized memory about the passage they read compared to the other group. This suggests believing you are going to teach increases your attention to detail and the way you organize information when you know you have to pass it on to others. This is quite a cool study but in practice it makes little sense for every student to teach every point on the syllabus. In addition, in a follow up study they used fill in the blank questions as the dependent variable and the teaching group only had marginally better recall. Perhaps testing students by having them write an essay or create a powerpoint and having other participants judge the quality of information would be a better measure. Still, we all know when we have done presentations on a topic the information generally sticks better than if we just skim read. This could still be a viable technique for revising, I always recommend students to create their own study guides and practice lots of exam questions. I have written Exam Technique Secrets and need some quality feedback and reviews from IB Psychology students in their 2nd year or alumni who have completed IB Psychology before I publish the final product. Exam Technique Secrets explains and summarizes everything I know from subject reports and mark schemes about how to maximize your marks and give your examiners what they want. Using these techniques is how I got a 7 in IB Psychology. If you are interested and motivated to get a 7 and have some free time then send me an email at ibpsychtutor@gmail.com for further details. The site has received a makeover so it is much cleaner and easier to navtiage. I have updated the biological page and fixed some broken links. More fixes are on the way. Remember you can always email me feedback or suggestions to improve this site. I have been very busy with school and have not updated in a while. I am currently creating my ultimate study guides which will be available as a downloadable PDF. These are my current priority and then I will update some of the free content on here which is still missing some important details. My apologies for the videos being down. I have reactivated my 4shared account and they should all be working now. Please report any broken links and I will fix them.